As an urban prepper, knowing how to forage gives you the option to look for alternative sources of food, which can be crucial if you’re trying to weather a long-term survival scenario. Weeds are often considered annoying eyesores, but when SHTF, some of them can be used to fill your belly. Just keep several things in mind before you start exploring your yard or the parks in your neighborhood. Ask for permission before foraging, especially on private property. Avoid foraging in areas exposed to direct traffic or areas treated with chemicals so you don’t end up poisoning yourself. Brush up on your foraging skills so you can properly identify the plants you’re about to eat. Consult a book on edible weeds before you start foraging. Get a book that’s for your specific geographic area, and try to buy a copy with color photos of the weeds. If you’re confident that your food stockpile can last for a long time, you can use edible plants to stretch a meal. When you run out of fresh or frozen vegetables, weeds can be a crucial source of vitamins and nutrients that can help you maintain a well-balanced diet during a disaster scenario. Here are five edibles that every urban forager should know. 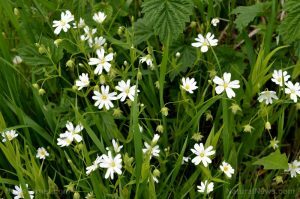 The common chickweed is also called satin flower or tongue grass. Found throughout North America, common chickweed can grow like a small bush, especially younger plants. Common chickweed can be foraged in the spring, and it grows in both urban and rural environments. The plant’s life duration may vary, and it can be annual, winter annual, or perennial. Common chickweed has oval leaves that are 1/8 to 4/5 inches long with entire leaf margins. The plant produces small white-petaled flowers. The stems and leaves of the plant are edible. Common chickweed can be eaten raw, but it is better to cook it since the plant contains saponins. When consuming large quantities of this plant, these chemicals will not be absorbed by the body, which can cause digestive issues. Common chickweed tastes like spinach, and you can cook it like a leafy green. Curly dock grows all over the U.S. Considered an invasive species, this plant is native to Europe and Western Asia. It is best to forage curly dock while the plant is still young. 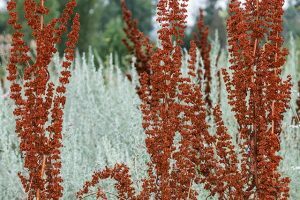 It’s a perennial plant that can be foraged from late spring to early summer. Curly dock has ovate and elliptical smooth leaves growing from a large basal rosette. Its leaf margin can be waved or curled. The plant produces inflorescence or a flower stalk that grows to around a foot high. Curly dock’s edible parts include leaf blades, the growing tips of leafy stems, and the seeds. Cut off the plant’s leaf stems before cooking the leaves because they are tough and stringy. Leaves can be used in a salad, in sandwiches, and as an alternative for lettuce. Boil curly dock leaves for several minutes to get rid of the astringent flavor. The leaves can also be sautéed or stir-fried while the seeds can be used as a grain. Dandelions are perennial plants that grow in a basal rosette. The leaves are narrow, deeply toothed, and typically point back toward the center of the plant. 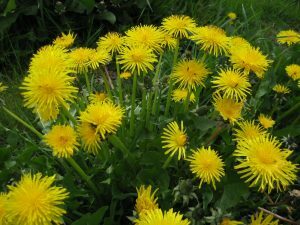 In folk medicine, dandelions are used as a therapeutic herb to cure diarrhea, eye issues, heartburn, skin issues, swelling, and an upset stomach. This weed is a better source of vitamins A and C than spinach and tomatoes, respectively. Dandelions also contain calcium, iron, potassium, and vitamins B and D. Use dandelions to make a tasty salad, with some pepper, salt, and vinegar to taste. Garlic mustard is a biennial edible, which means it has a two-year life cycle. In the first year, garlic mustard produces a low-growing rosette of leaves with heart-shaped, scalloped edges. During the second year, garlic mustard can grow as a tall flower stark in the early spring. In this growth stage, the leaves along the flower stalk of garlic mustard plants are more triangular with toothed edges. The plant grows flowers in clusters, and each flower has four white petals. Garlic mustard leaves are edible and they have a strong garlic smell. Add garlic mustard leaves to soups, stews, or stir-fried dishes for added flavor. 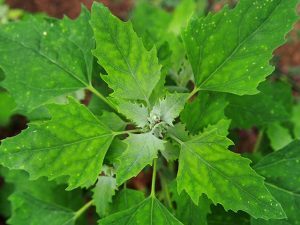 Lamb’s quarters’ leaves are coated by a white powder, and this wild edible often looks dusty when seen from afar. The plant produces tiny green flowers that form in clusters on top of spikes, and the leaves resemble the shape of a goose’s foot. The growing tips of lamb’s quarters’ leafy stems, leaves, bud clusters, and seeds are all edible. Lamb’s quarters is best eaten either boiled or steamed. Prepare this plant like you would spinach by boiling in a bit of water, sautéing, or steaming. These mild-tasting wild greens are full of vitamins and minerals. 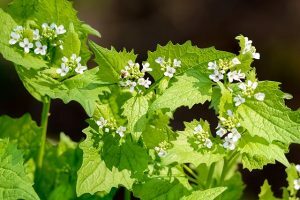 As an urban prepper, knowing about edible weeds can help you locate unlikely food sources when SHTF.